For me the fragrance of fall is that of new beginnings. The metaphor of new beginnings is usually reserved for spring; but I think of spring as a season of awakening. The start of a new school season, the dawn of cooler weather, the inception of fruiting, and yes, the arrival of a new football season, are all new beginnings that I associate with autumn. Somehow the smell of autumn triggers memories for me that in turn spark feelings. Fall fragrances evoke a longing to know when to be still to take-in the embroidery of the chromatic flush that will take us through winter’s dull tones. The season to enjoy the brilliant colors of autumn is upon us. When we look at total color patterns, big waves of yellow are moderated by orange, and if everything works as predicted, followed by a short brilliant burst of red. However, some of our earliest turning woody plants such as gum trees (Nyssa species) and sumacs (Rhus species) are in the red spectrum, defying autumn color norms. 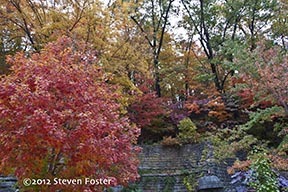 The first big wave of glorious yellows and reds are from sugar maples (Acer saccharum). Color also depends upon the mix of vegetation, where trees grow, and where they originate. The sugar maples, for example, are associated with northern deciduous forests, and often occur on north-facing slopes. 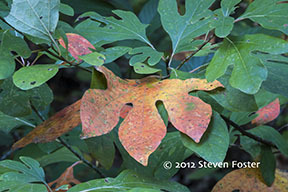 Our mixed oak-hickory upland forests usually present a dull pastel of browns and yellows. Trees in valley floors, such as sycamores along water ways, tend to turn earlier than trees on ridge tops. 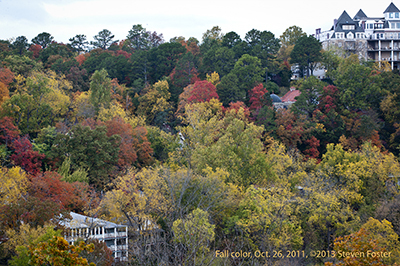 There is no single, definitive answer to the question of why trees turn color. Much of our understanding is physiological. Healthy leaves with good leaf volume in later September help to predict good autumn color. If we are generally free from rain, wind and overcast skies for the first three weeks of October, we will have better color. We want cool, bright, sunny days with no freezing temperatures. A major factor among a myriad of variables is the diminishing length of the autumn day, hence the amount of daylight. Production of chlorophyll ceases, and as the green chlorophyll degrades, sugars and anthocyanadins (the vast group of compounds responsible for color combinations of fruits, leaves and flowers) begin to dominate the leaves, aided by the variables of moisture and temperature changes. The recipe changes from year-to-year and species-to-species. This is conventional wisdom. In the last 20 years an entirely new field of study—plant-animal interactions—hints of broader mechanisms, a more wholistic view, beyond mere physiology. Fall colors are integrated in nature signaling to fruit-loving animals and insects that fruits are ready to pluck, thus aid in seed dispersal. 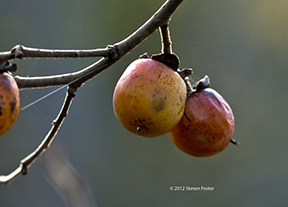 In some trees, the colors may send a signal to insect herbivores that feeding time is over. The new science of autumn tree color suggests the process is a mix of defensive, seed-dispersing, signaling, and physiological functions all working in symphonic harmony to create the intricate beauty we enjoy. When to expect the peak of fall color, you ask? Trying to predict the peak of fall color is not as easy as predicting when the next Full Moon. Autumn color, while falling into a predictable time range is subject to the variables of light, cold, heat, moisture, and the little understood symphony of all of nature working in concert. If you record peak color days over time, predictable patterns will repeat themselves. Short of keeping a journal, our digital devices record the date we snap an image in the metadata of the image itself. I bought my first digital camera in 2004. Since the fall of 2005 in the Ozarks near the Arkansas-Missouri borders my best fall foliage photos (dates as recorded by digital camera) are taken during the last week of October through the first week of November. Therefore, my prediction for peak foliage this year along the counties skirting the state borders is precisely October 26th (give or take a week). Predictions aside, our role in the process is simply to enjoy the beauty of nature. ©2013 Steven Foster, adapted from my “Eureka Nature” column in the Eureka Springs Independent Newspaper for 3 October 2013 and 8 November 2012.